​We knew we had found the perfect teacher for the Osborne Association's YES Summer Program when we met Isaac Tecosky. A compassionate Dharma Yoga Teacher, Isaac came to the practice through Hip Hop music and currently offers his unique and inspiring teachings at the Manhattan Detention Center and around the NYC area. 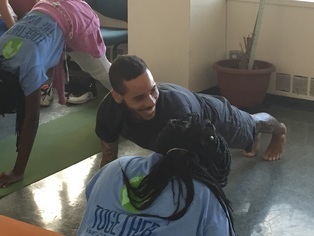 The 13-15 year old teens that Isaac will be offering Yoga to this August are participants in the Osborne Assocation summer program for teens with one or both parents incarcerated. Isaac's passion for offering tools for self awareness and recognizing each persons inner beauty are sure to have a profound impact on the children this summer! Isaac Tecosky practices Yoga to study why it is we suffer and how to prevent further suffering. Isaac teaches Yoga to share whatever it is he has learned along the way. He believes compassion, self study, and a little angry determination are tools to help ignite knowledge, wisdom, and understanding. 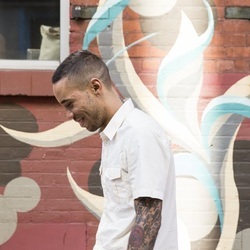 He is a student and teacher of Dharma Yoga, living and teaching in the greater New York area. Founded by Thomas Mott Osborne, now considered the “pioneer and prophet of prison reform,” the Osborne Association has an 83-year history of leadership in working with currently and formerly incarcerated men, women, and children and families affected by the incarceration of a loved one. They are known for developing effective programs that offer a broad range of treatment, education, and vocational services to more than 10,000 people each year. As the oldest and most experienced organization in New York State serving men and women involved with the criminal justice system, Osborne operates at several sites throughout the state, including the Bronx, Brooklyn, Newburgh, Rikers Island, and in several state correctional facilities. Youth Experience Success (YES!) provides weekly group workshops to increase knowledge and self-awareness, build skills and encourage behavior change that will allow participants to meet the four program goals. Each goal is addressed through workshops that include being the child of an incarcerated parent, financial literacy, job readiness, sexual health, legal rights, loss and identity, fear of failure and fear of success, and the college selection and application process. All workshops are delivered within the context of these young people’s unique family situations, and provide opportunities for them to discuss their parent’s incarceration with their peers. YES! also includes two community service projects to strengthen awareness of community issues and to promote personal growth and self-esteem.